Consumers and B2B customers alike are inundated with marketing messages, and capturing mindshare and share-of-wallet is no easy task as audiences become fatigued by marketing emails. To further exacerbate the problem, many marketers today are still not targeting their emails effectively, preferring to take the path of least resistance and send the same message to either multiple cohorts or to their entire database. 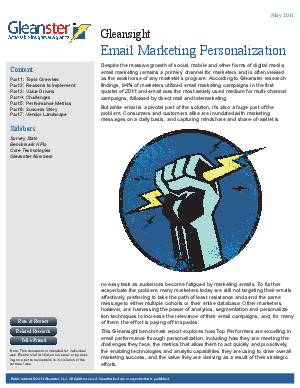 Other marketers, however, are harnessing the power of customer analytics and personalization techniques to increase the relevance of their email campaigns - and, for many of them, the effort is paying off in spades.